The Twenty-seventh Amendment (Amendment XXVII) to the United States Constitution prohibits any law that increases or decreases the salary of members of Congress from taking effect until the start of the next set of terms of office for Representatives. The amendment is the most recent to be adopted, but one of the first proposed. It was submitted by the 1st Congress to the states for ratification on September 25, 1789, along with eleven other proposed amendments. While ten of these twelve proposals were ratified in 1791 to become the Bill of Rights, what would become the Twenty-seventh Amendment and the proposed Congressional Apportionment Amendment did not get ratified by enough states for them to also come into force with the first ten amendments. The proposed congressional pay amendment was largely forgotten until 1982, when Gregory Watson, a 19-year-old sophomore at the University of Texas at Austin, wrote a paper for a government class in which he claimed that the amendment could still be ratified. A teaching assistant graded the paper a "C" and an appeal to the professor, Sharon Waite, failed, motivating Watson to launch a nationwide campaign to complete its ratification. The amendment eventually became part of the United States Constitution, effective May 5, 1992, completing a record-setting ratification period of 202 years, 7 months, and 10 days. Several states raised the issue of Congressional salaries as they debated whether to ratify the Constitution. The North Carolina ratifying convention proposed several amendments to the Constitution including the following: "The laws ascertaining the compensation of senators and representatives, for their services, shall be postponed in their operation until after the election of representatives immediately succeeding the passing thereof; that excepted which shall first be passed on the subject." Virginia's ratifying convention recommended the identical amendment. New York's declaration of ratification was accompanied by a similar amendment proposal: "That the Compensation for the Senators and Representatives be ascertained by standing law; and that no alteration of the existing rate of Compensation shall operate for the Benefit of the Representatives, until after a subsequent Election shall have been had." This amendment was one of several proposed amendments to the Constitution introduced by Representative James Madison of Virginia in the House of Representatives on June 8, 1789. Madison's original intent was that it be added to the end of Article I, Section 6, Clause 1 of the Constitution ("The Senators and Representatives shall receive a Compensation for their Services, to be ascertained by Law, and paid out of the Treasury of the United States"). This, along with Madison's other proposals were referred to a committee consisting of one representative from each state. After emerging from committee, the full House debated the issue and, on August 24, 1789, passed it and sixteen other articles of amendment. The proposals went next to the Senate, which made 26 substantive alterations. On September 9, 1789, the Senate approved a culled and consolidated package of twelve articles of amendment. On September 21, 1789, a House–Senate conference committee convened to resolve numerous differences between the House and Senate Bill of Rights proposals. On September 24, 1789, the committee issued its report, which finalized 12 proposed amendments for the House and Senate to consider. The House agreed to the conference report that same day, and the Senate concurred the next day. What would become the Twenty-seventh Amendment was listed second among the twelve proposals sent to the states for their consideration on September 25, 1789. Ten of these, numbers 3–12, were ratified fifteen months later and are known collectively as the Bill of Rights. The remaining proposal, the Congressional Apportionment Amendment, has not been ratified by enough states to make it part of the Constitution. This proposed amendment was largely forgotten until Gregory Watson, an undergraduate student at the University of Texas at Austin, wrote a paper on the subject in 1982 for a political science course. In the paper, Watson argued that the amendment was still "live" and could be ratified. Watson received a "C" grade for his paper from one of the course's teaching assistants. Watson appealed the grade to the course instructor, Sharon Waite, who declined to overrule the teaching assistant. Recalling the paper, Waite stated, "I kind of glanced at it, but I didn't see anything that was particularly outstanding about it and I thought the C was probably fine". Watson responded by starting a new push for ratification with a letter-writing campaign to state legislatures. In Dillon v. Gloss, 256 U.S. 368 (1921), the Supreme Court remarked that "ratification [of a proposed constitutional amendment] must be within some reasonable time after the proposal", and suggested that it was "quite untenable" to view proposed amendments from 1789, 1810, 1861 as still pending. However, in Coleman v. Miller, 307 U.S. 433 (1939), the court ruled that the validity of state ratifications of a constitutional amendment is political in nature—and so not a matter properly assigned to the judiciary. 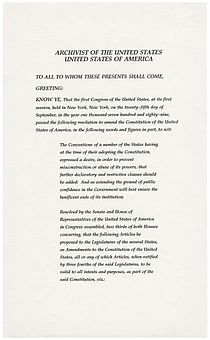 It also held that as a political question, it was up to Congress to determine if an amendment with no time limit for ratification was still viable after an extended lapse of time based on "the political, social and economic conditions which have prevailed during the period since the submission of the amendment". When Watson began his campaign in early 1982, he was aware of ratification by only six states and he erroneously believed that Virginia's 1791 approval was the last action taken by the states. He discovered in 1983 that Ohio had approved it in 1873 as a means of protest against the Salary Grab Act and learned in 1984 that Wyoming had done the same 105 years later in 1978, as a protest against a congressional pay raise. Further, Watson did not know, until 1997, well after the amendment's adoption, that Kentucky had ratified the amendment in 1792. Neither did Kentucky lawmakers themselves—in Watson's desire for a 50-state sweep, the Kentucky General Assembly post-ratified the amendment in 1996 (Senate Joint Resolution No. 50), at Watson's request, likewise unaware that the task had already been attended to some 204 years earlier. In April 1983, Maine became the first state to ratify the amendment as a result of Watson's campaign, followed by Colorado in April 1984. Numerous state legislatures followed suit. Michigan's ratification on May 7, 1992, provided what was believed to be the 38th state ratification required for the archivist to certify the amendment—Kentucky's 1792 ratification having been overlooked. In 2016, Zach Elkins, a professor in the UT Department of Government, became interested in Watson's story and began to document its origins. He tracked down Sharon Waite, who had left academia in the 1980s to work on her family's citrus farm. Elkins suggested to Waite that they change Watson's grade. In 2017, Elkins submitted a grade change form with Waite's signature and a grade change to "A+". In an interview with NPR, Waite stated, "Goodness, he certainly proved he knew how to work the Constitution and what it meant and how to be politically active, [...] So, yes, I think he deserves an A after that effort — A-plus!" The registrar approved a grade change to "A", because the university does not give grades higher than "A". 1The Archivist did not certify the amendment until May 18, 1992, with 40 states listed as ratifying the amendment. Kentucky's then-unknown 1792 ratification would have made it 41 states that had ratified at the time of certification, 3 more than the 38 required for a three-quarters majority. Four states have not ratified the Twenty-seventh Amendment: Massachusetts, Mississippi, New York, and Pennsylvania. 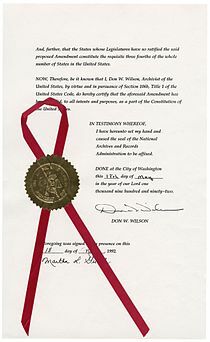 On May 19, 1992, the 27th Amendment's certificate of ratification, signed by the Archivist of the United States on May 18, 1992, was printed and published in the Federal Register. The response in Congress was sharp. Senator Robert Byrd of West Virginia scolded Wilson for certifying the amendment without congressional approval. Although Byrd supported Congressional acceptance of the amendment, he contended that Wilson had deviated from "historic tradition" by not waiting for Congress to consider the validity of the ratification, given the extremely long lapse of time since the amendment had been proposed. Speaker of the House Tom Foley and others called for a legal challenge to the amendment's unusual ratification. 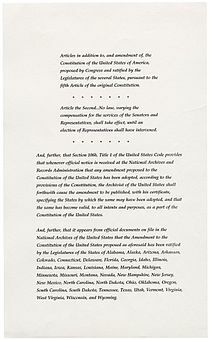 On May 20, 1992, under the authority recognized in Coleman, and in keeping with the precedent established regarding the ratification of the Fourteenth Amendment, each house of the 102nd Congress passed its own version of a concurrent resolution agreeing that the amendment was validly ratified, despite the unorthodox period of more than 202 years for the completion of the task. The Senate's approval of the resolution was unanimous (99 to 0) and the House vote was 414 to 3. Congressional cost-of-living adjustments (COLA) have been upheld against legal challenges based on this amendment. In Boehner v. Anderson, the United States Court of Appeals for the District of Columbia Circuit ruled that the Twenty-seventh Amendment does not affect annual COLAs. In Schaffer v. Clinton, the United States Court of Appeals for the Tenth Circuit ruled that receiving such a COLA does not grant members of the Congress standing in federal court to challenge that COLA; the Supreme Court did not hear either case and so has never ruled on this amendment's effect on COLAs. ^ Alabama and Missouri both ratified the amendment on May 5, 1992, with the Archivist of the United States then recording Alabama as the 36th and Missouri the 37th state to ratify the amendment. ^ Berke, Richard (May 8, 1992). "1789 Amendment Is Ratified But Now the Debate Begins". The New York Times. Retrieved March 24, 2016. ^ a b The U.S. Constitution and Constitutional Law. Britannica Educational Publishing. 2012. pp. 105–108. ISBN 9781615307555. ^ "The Bill of Rights: A Transcription". Archives.gov. Retrieved November 4, 2016. ^ a b c d Bernstein, Richard B. (1992). "The Sleeper Wakes: The History and Legacy of the Twenty-Seventh Amendment". Fordham Law Review. 61 (3): 497–557. Retrieved June 9, 2013. ^ Gordon Lloyd. "Madison's Speech Proposing Amendments to the Constitution, June 8, 1789". TeachingAmericanHistory.org. Ashland, Ohio: The Ashbrook Center at Ashland University. Retrieved November 1, 2015. ^ Schwartz, Bernard (2002). The Great Rights of Mankind: A History of the American Bill of Rights (First Rowman & Littlefield ed.). Lanham, Maryland: Rowman & Littlefield. p. 186. ISBN 9780945612285. Retrieved June 29, 2014. ^ Scott Bomboy (May 7, 2018). "How a C-grade college term paper led to a constitutional amendment". Constitution Daily. ^ a b c Largey, Matt (May 5, 2017). "The Bad Grade That Changed The U.S. Constitution". All Things Considered. NPR. Retrieved December 20, 2018. ^ Frantzich, Stephen E. (2008). Citizen Democracy: Political Activists in a Cynical Age (3rd ed.). New York: Rowman & Littlefield. pp. 12–14. ISBN 9780742564459. ^ "27: Congressional pay raises". Pittsburgh Post-Gazette. November 27, 2002. Retrieved July 9, 2013. ^ a b c Dean, John W. (September 27, 2002). "The Telling Tale of the Twenty-Seventh Amendment". FindLaw. Retrieved July 9, 2013. ^ Bomboy, Scott (May 7, 2016). "How a C-grade college term paper led to a constitutional amendment". National Constitution Center. Retrieved September 8, 2016. ^ Rowley, Sean (September 2, 2014). "27th amendment aimed at congressional pay". Tahlequah Daily Press. Retrieved September 8, 2016. ^ "POM-624" (PDF). Congressional Record - Senate: 14940. June 21, 1996 – via GPO - govinfo.gov. ^ a b c d e Herman, Ken (March 14, 2017). "Herman: 35 years later, A+ for Austinite who got Constitution amended?". Austin American-Statesman. Retrieved December 16, 2018. ^ webmasters, NC General Assembly. "North Carolina General Assembly - House Bill 1052 Information/History (1989-1990 Session)". www.ncleg.net. ^ a b Chapter XII, June Session 1792. The Statute Law of Kentucky: With Notes, Prælections, and Observations on the Public Acts... Frankfort: William Hunter. 1809. pp. 76–77. ^ a b c James J. Kilpatrick, ed. (1961). The Constitution of the United States and Amendments Thereto. Virginia Commission on Constitutional Government. p. 64. ^ Congressional Record of the 102nd Congress, Volume 138 – Part 9, May 19, 1992, p. 11656. ^ a b Michaelis, Laura (May 23, 1992). "Both Chambers Rush to Accept 27th Amendment on Salaries". Congressional Quarterly. p. 1423. ^ Kyvig, David E. (1996). Explicit and Authentic Acts: Amending the U.S. Constitution, 1776–1995. Lawrence: University Press of Kansas. pp. 467, 546n17. ISBN 9780700607921. ^ a b c "The Organic Laws of the United States of America". Archived from the original on December 5, 2010. Retrieved December 5, 2010. ^ Young, JoAnne (April 1, 2016). "It took awhile, but add Nebraska's name to the list". Lincoln Journal-Star. Archived from the original on December 19, 2018. Retrieved August 2, 2016. ^ "Certification of Twenty-seventh Amendment" (PDF). Federal Register. National Archives and Records Administration. 57 (97): 21187. May 19, 1992. Retrieved December 16, 2018. The Constitution of the United States of America: Analysis and Interpretation. (Senate Document No. 103–6). (Johnny H. Killian and George A. Costello, Eds. ), Washington, D.C.: United States Government Publishing Office. 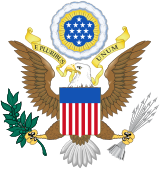 Wikimedia Commons has media related to Twenty-seventh Amendment to the United States Constitution.